Born on April 17, 1912 as the youngest of twelve children in Culloden, Georgia, Jo Ann Robinson would become a successful educator and famous civil rights activist. 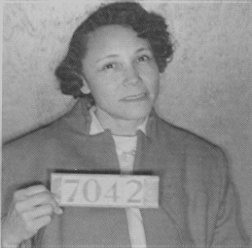 After graduating from Fort Valley State College in 1934, she became a public school teacher in Macon, Georgia and married Wilbur Robinson for a brief time. She later earned an M.A. in English at Atlanta University. She accepted a position at Alabama State College in Montgomery and joined the Women’s Political Council (WPC) then headed by Mary Fair Burks. Robinson was verbally attacked by a bus driver in 1949. That incident persuaded her that the city’s racial structure had to change. In 1950, she became president of the WPC and led the group’s efforts to focus attention on the abuses of white bus drivers toward black passengers. When Rosa Parks was arrested for refusing to move to the back of the bus on December 1, 1955, Robinson spent the entire night printing out 35,000 handbills calling for a boycott of the Montgomery bus system. She and supporters passed the following Monday. After the successful one-day boycott, other local leaders including Reverends Ralph Abernathy and Martin Luther King and labor union activist E.D. Nixon joined Robinson in establishing the Montgomery Improvement Association (MIA) with Reverend Martin Luther King as president. The MIA now planned a longer more extensive boycott to protest racial segregation and discrimination on city buses. Robinson became the MIA newsletter editor and served on its executive board. Jo Ann Robinson and other WPC members helped sustain the year long boycott by providing transportation for numerous black residents. Eventually a court ruling forced Montgomery to desegregate its busses. Moreover the boycott, the first successful protest of segregation in the Deep South, inspired other civil rights demonstrations in the late 1950s and throughout the 1960s. In 1960, Robinson moved to Louisiana where she taught at Grambling College for one year. She then moved to Los Angeles in 1961 to teach English in the city’s public schools until her retirement in 1976. Throughout this time she continued to participate in local women’s organizations but she was never again a civil rights activist. Jo Ann Robinson died in Los Angeles, California in 1992. Jo Ann Robinson, The Montgomery Bus Boycott and the Women Who Started It (Knoxville, Tennessee: University of Tennessee Press, 1987); Russell Freedman, Freedom Walkers: the Story of the Montgomery Bus Boycott (New York: Holiday House, 2006). Bus Boycott (New York: Holiday House, 2006).